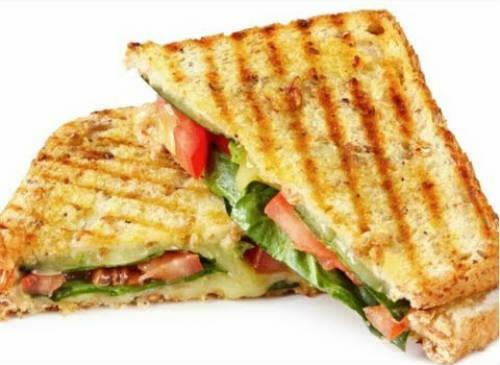 Delicious and healthy sandwich with vegetables and oats. 2. Add the green chillies, onions, tomatoes and carrots. 3. Saute for 2 minutes. 4. Add the mashed potatoes and green peas. 6. Add garam masala powder, red chilli powder, oats and salt. 7. Stir well and cook for 2 to 3 minutes. 8. Add mint leaves and coriander leaves. 9. Remove from flame after a minute. 10. Toast the bread slices. 11. Add some of the oats mixture to a bread slice and spread evenly. 12. Cover with another slice and cut into half. 13. Serve with tomato sauce. Feel free to comment or share your thoughts on this Oats Sandwich Recipe from Awesome Cuisine.